Happy New Year's Eve, all! In honor of the end of 2016 (thank goodness, to be honest) I'm taking a look back at the 5 most popular recipes of 2016. In 6 months of blogging, these 5 recipes have been visited, shared, repinned, and liked the most. I can see why, these recipes are among my favorites too. In addition to sharing some of the best recipes from the year, I also want to give you a 2017 preview for what you can look forward to in the coming year from the Millennial Menu! In 2017, I'll continue to bring you delicious and easy recipes for millennial and non-millennial readers alike, plus tips and tricks for navigating your kitchen and the grocery store. In addition, I'll be doing more travel recommendations as part of the Millennial Menu On the Go series. I currently live in Boston so get ready for a long list of my favorite spots. I also plan on including restaurants I love in New York, D.C., and all my favorites from studying and traveling abroad during college. I'm extremely blessed to be traveling back to Rome in April, where I studied abroad in 2014, and can't wait to share my favorite places in the Eternal City with you (all on my shiny new DSLR camera that I didn't have when I studied abroad there!). Look forward to a huge Rome post coming at you sometime early May. I'm also officially opening things up for suggestions and feedback. If there's something you're looking for from the blog, please let me know. Whether it's a recipe that looks too complicated you'd like to see a millennial menu twist on, tips for how to cook a certain type of food or a challenge you need guidance on in the kitchen, or simply restaurant recommendations, reach out via my Contact page, social media (linked at the top right of the blog), or the comment section right below on this post. And now, on to the good stuff: the food! This Creamy Asiago Pasta with Sun-dried Tomatoes recipe is delicious and honestly, it's almost better leftover once the pasta has soaked up the creamy asiago sauce - meaning you can make a whole box of pasta at the beginning of the week and enjoy it more than once. Another bonus? It's on the table in 30 minutes. Maybe it's because this picture looks so damn delicious, but this recipe for Butternut Squash & Sage Tortellini took off on Pinterest. I could eat the smooth, creamy butternut squash sauce with a spoon. Mmm. Shakshuka is so in right now, so it's no surprise that this Shortcut Shakshuka recipe is one of my most popular. Tons of flavor and depth in under 10 minutes - as little as 7 if you're fast. 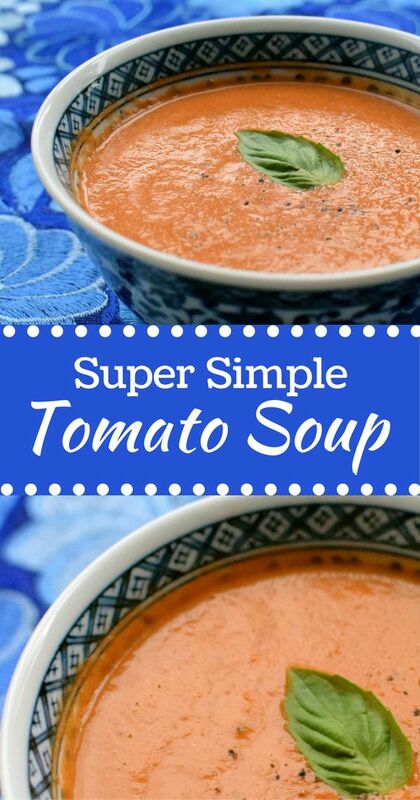 Nothing beats a warm, hearty bowl of this Super Simple Tomato Soup recipe. Everyone needs an easy to make, easy to freeze soup - this one's the winner. Enjoy it with a cheesy, gooey grilled cheese. Plus, tomatoes are a superfood! Everyone loves BBQ Chicken pizza, and this recipe allows you to make your own Easy BBQ Chicken Pizza recipe at home, in 15 minutes. Use my favorite Stonefire Naan for your crust and check out my other pizza recipes!